Airport lounges have reduced the stress of traveling immensely, once through security the relaxation of kicking back before a flight not being pushed around in uncomfortable terminal chairs is amazing. As a American Express Platinum card member I have access to the Centurion lounges around the United States and internationally. As a general rule if I don’t have access to a Delta Sky Club I will always prefer a Centurion Lounge to anything else available. My recent trip through San Francisco found me not flying Delta surprisingly for the first time in a long time and thus I didn’t have access to the Delta Sky Club. 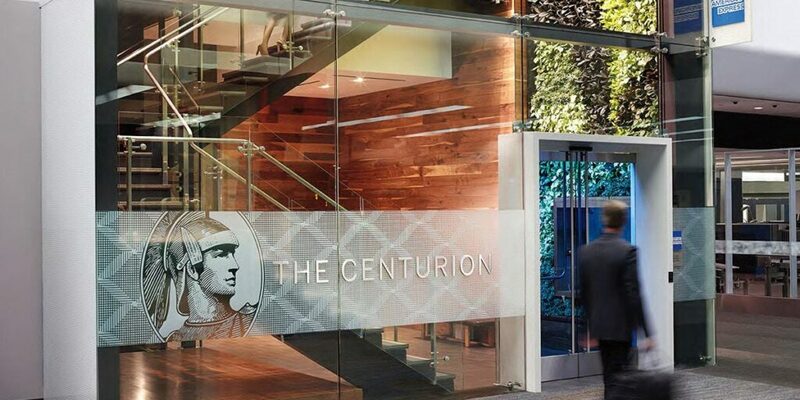 The San Francisco Centurion Lounge is a massive two floor lounge available now exclusively for Platinum and Centurion card holders. Overall the level of service I’ve gotten at these lounges has been amazing. The San Francisco Centurion Lounge takes up two floors and is beautifully encased in a ground to second-floor windows that bear the American Express logo accented in blue and surrounded by leaves and greenery. To gain access to the lounge you actually have to go to the second story which requires a long stair case climb with your luggage or waiting for the incredibly slow elevator to take you up to the reception desk. I’ve always had good interactions with Centurion Lounge staff members and was warmly greeted and checked in quite quickly. I was there around 8AM and my wait time was minimal to check-in, which was surprising for how busy the airport and even the lounge was. After being updated on my flight information I was shown a quick point out of major things available in the lounge and sent on my way. All the seating was found on the second level and included a variety of options such as normal bucket seats, high backed seats for privacy, couches, the dining area had a fair amount of tables, and my personal favorite wall couch seats big enough to lay down and relax in. While the lounge was fairly busy and packed with a lot of people it was easy to find seats of any type that you were looking for. With the constant motion of the lounge if you didn’t get the seat that you actually wanted it wouldn’t be very long before someone got up and you could snag their seat as they left. The lounge had a full dining area that included a full bar and buffet style food designed by an award winning local chef. 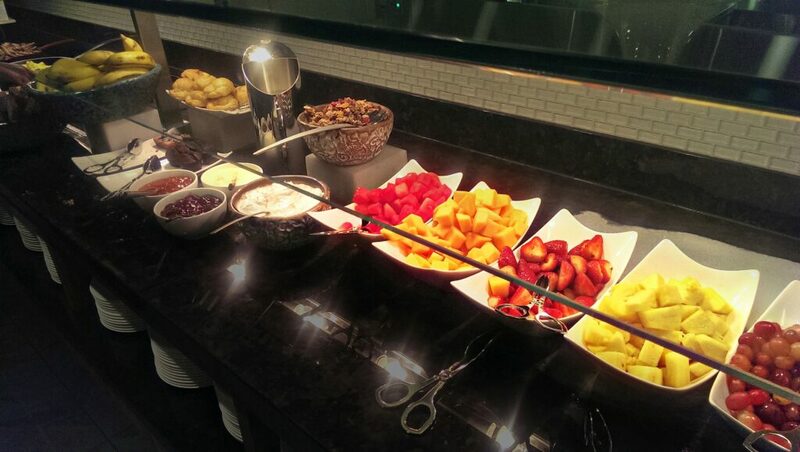 I happened to be there during the breakfast time and there was a healthy assortment of hot and cold foods that ranged from egg based dishes to fruit and bread products. The bar was freely handing out mimosa and free wine tasting tickets. This lounge has a quite neat feature in that you can sample local wines from a vending machine like system. The bartender has tickets with bar codes limiting you to five tastings. 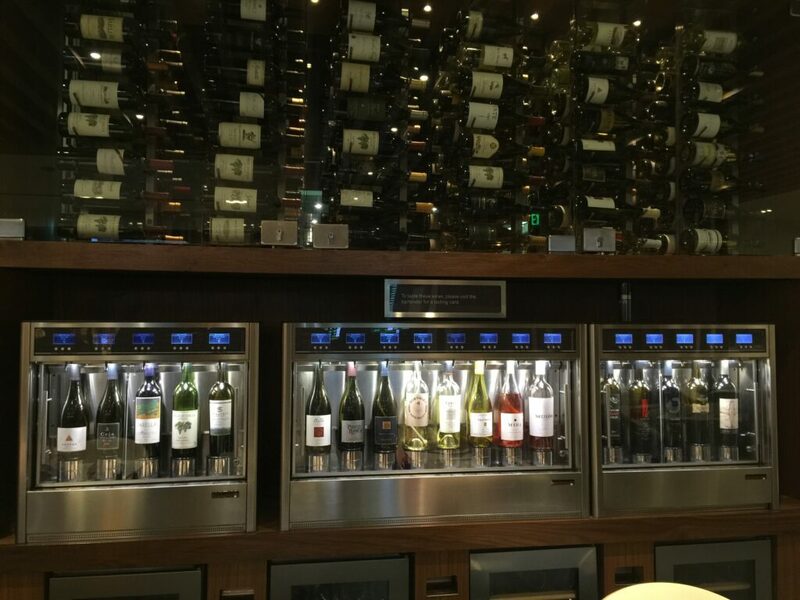 At the machine you step up and choose which wine you want, the bottles are displayed for viewing prior to choosing and with a simple scan of your ticket it will dispense the perfect amount of wine for your tasting pleasure. Because California is such a wine heavy state they feature different local wines for tasting and offer for you to buy a wine bottle if you like it that much. Wireless was very sub par on the day that I visited, I wasn’t even able to finish a speed test without the wifi dropping on me. During the two hours that I stayed in the lounge I only was ever able to get reasonable web page load times and video streaming was nonexistent. I’ve seen and heard about the wifi being a lot faster on average so it seems like your mileage may vary. Overall your wifi speed will probably vary by the time of day and busyness of the lounge at the time of use. With recent restrictions recently being imposed for access to the Centurion Lounge congestion levels will probably decrease and allow for more of a chance of the seats you want. Food is always reasonably good to keep yourself fed while waiting for your flight. I put the lounge’s food somewhere between a first class domestic hot meal on the low-end and Delta Sky Club food on the high-end. With the local food inspirations, free wine, and booze it keeps me just a little bit happier when I fly. Seats are reasonably comfortable and you can always pick your level of privacy from the range of available seats. 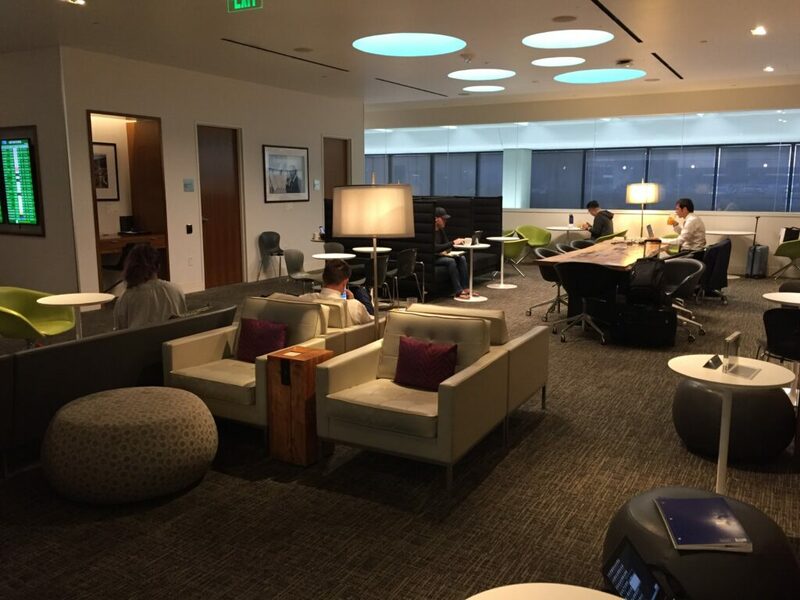 I’ve always had very good experiences at Centurion Lounges and this one is no exception, especially if you need a place to relax after or before a long flight. I've always had very good experiences at Centurion Lounges and this one is no exception, especially if you need a place to relax after or before a long flight.